Last Sunday, we had a Baby-Q…not to be confused with a baby shower (even though nearly everyone we invited called it a baby shower). 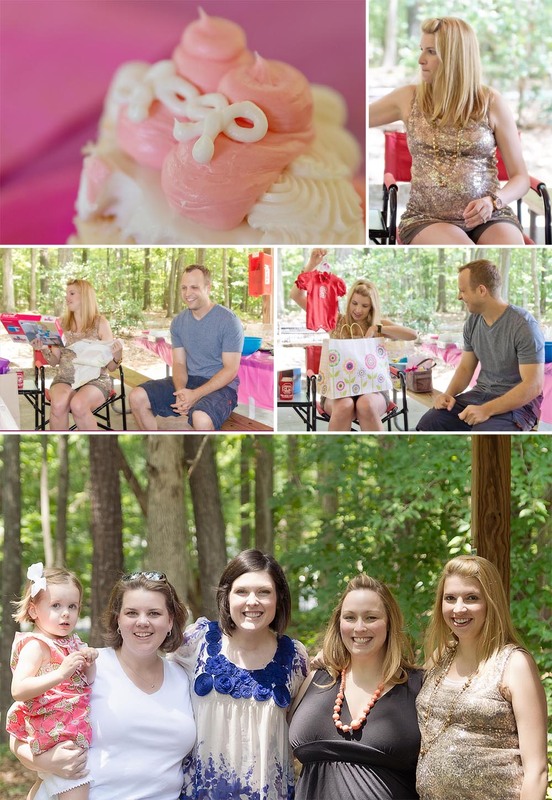 Apparently, a few of my husband’s friends kept asking him if we were going to have anything (shower/party, etc) before the baby arrived…so it just made since to have one big party and invite all our friends and their families. I took a few photos before everyone arrived and then handed my camera off to a friend of mine while we opened gifts. I can only assume that you’re interested in seeing how it all went down. While I’m here, I might as well give my 33 week bump report. How far along: 33 weeks (technically, 33 weeks and 3 days today). How big is the baby: This week our baby weighs a little over 4 pounds and has passed the 17-inch mark. She’s rapidly losing that wrinkled, alien look and her skeleton is hardening (I concur – I can feel it). The bones in her skull aren’t fused together, which allows them to move and slightly overlap, thus making it easier for her to fit through the birth canal. Based on what the doctor said this week, I am measuring right on track. As far as I’m concerned, this is the one area where I’m completely content with my baby being average. Total weight gain: My sister-in-law is likely to throw stones at me, but I haven’t gained any weight this week (and I tried really hard eating hot dogs, hamburgers and cake). In fact, during my weigh in yesterday, I was up a mere 1 lb from my last weigh in two weeks ago. So, we’re still at a total of 19 lbs since the start of my pregnancy. Sleep: I experienced a bit of insomnia this week. This used to happen quite frequently when my husband was traveling for work – more times than not, I would just sleep in the other room so he could get a good night’s rest before getting up early in the morning to drive. This week, he had an important meeting and needed to be up early. For whatever reason, I just couldn’t turn my brain off…nor could I get comfortable. On top of that, every time I moved, Kitty Paw would just move with me so I was cramped all night. Luckily it was only that one night. Maternity Clothes: Nothing worth talking about here – at least as it relates to me. If we’re talking baby clothes…I’m obsessed. Yes, my mom owns a children’s boutique and I know for fact that my baby is going to be dressed well. However, I’m human…and baby clothes are cute. In particular, those ruffled bloomers are adorable. I can’t wait to have my own little doll baby to dress up. Best moments of the week: Baby-Q! It really was a blast. 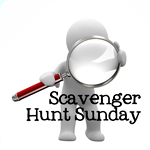 What more could expecting parents want than good friends, good food and fun gifts for baby? I can’t think of anything either. Food cravings: I just read last week’s report at this point…and yeah, pancakes still sound good – specifically pumpkin or blueberry pancakes, not hot cakes at McDonald’s. Food aversions: I don’t want anything to do with hot dogs or hamburgers for a LONG LONG TIME. Flat belly button (and often an outtie)…check. Lower back pain (on and off all day)…check. Exercise: I mustered up enough energy this week to hit the gym four days this week. I move slow, but I’m still moving. Movement: She’s still moving, but it’s getting a bit tight in there. Her heart rate was up in the 140s yesterday, so she’s definitely not just chilling out (she’s usually in the 130 range). 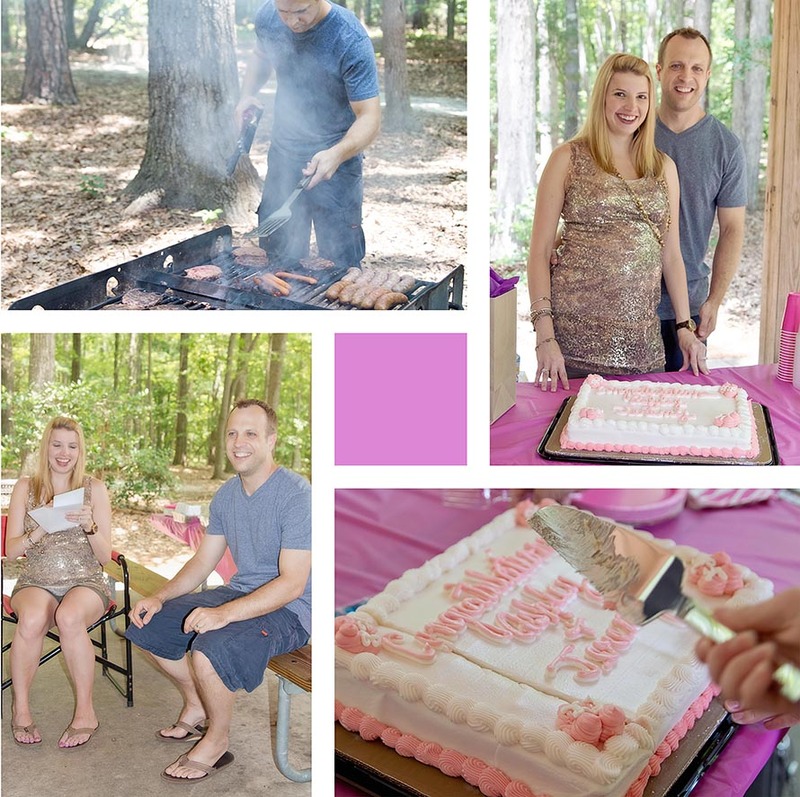 What I’m looking forward to: Our final baby shower in my hometown – next weekend. I’m also in my last two full-time weeks of work so I’m looking forward to resting up during the month of July…by the pool of course. What I miss: the ability to walk normally.